SUNS Head of Women’s Football Fiona McLarty has been announced as a finalist in the Gold Coast Bulletin’s Women of the Year awards. McLarty was nominated last year in the Champions of Sport category and beat out a host of respected Gold Coast women to make the top three in her category. McLarty will be up against fellow finalists Linda Monro, a netball coach from Palm Beach, and Amber Pilley, an Australian Rugby 7s and Brisbane Broncos NRL Women’s representative for the award. “It’s so humbling to have my name up there with some of these inspirational women in sports across the Gold Coast,” McLarty told goldcoastfc.com.au. “I was really surprised to just even be nominated, but to be named as a finalist is incredibly flattering. McLarty has 17 years of experience working at all levels in the AFL industry, from player, coach to administrator. 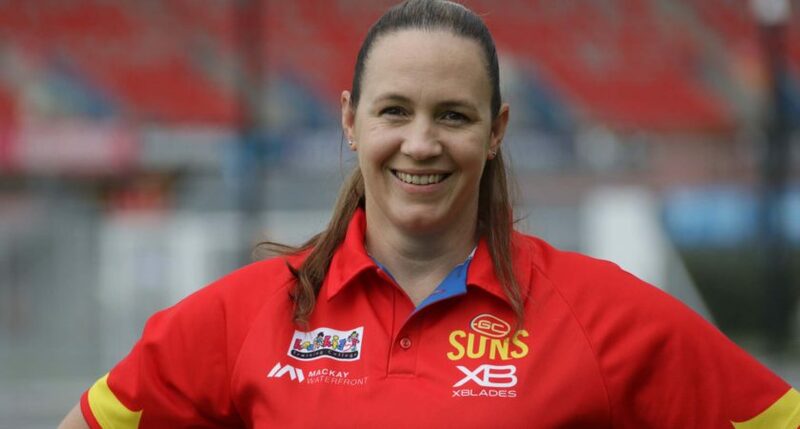 She has been a driving force in the SUNS’ acquisition of an AFLW license for 2020 and in the new role of Head of Women’s football will be responsible for the first ever female list build at the Gold Coast SUNS. “This year will be extremely exciting for our football club and the Gold Coast community,” McLarty said. “We’ll be conducting talent searches once again up in North Queensland and on the Gold Coast to identify skilled players and use that to shape an exciting team to represent this great region. The Women of the Year awards will be announced in a ceremony on International Women’s Day with a special magazine released in celebration. The public can vote for one finalist in the People’s Choice Award. Click here for more information.